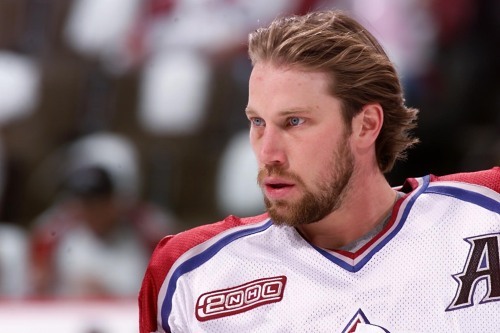 Seeing how peaceful and quiet he is off the ice, it’s almost hard to remember how ferocious Peter Forsberg was on it. During his playing days, there were few in the game of hockey that could match what Forsberg could do on the ice. He was finesse, intelligence and sheer power rolled into one nearly unstoppable force. So it is little surprise that he was voted into the Hockey Hall of Fame, inducted as a member of the Class of 2014. There was never a dull moment for “Peter the Great”, either. When he wasn’t ready to tackle the ice of the NHL, he was setting World Junior Championships scoring records (31 points in 7 games, still a record) or getting himself on a postage stamp back in his native Sweden by scoring an iconic goal in the Winter Olympics. He also happened to be a part of one of the most famous trades in NHL history: he, along with Steve Duschene, Kerry Huffman, Mike Ricci, Ron Hextall, Chris Simon, $15 million cash and Philadelphia’s first-round picks in 1993 and 1994 were sent to Quebec for “The Next One”, Eric Lindros. Though Lindros dominated from the outset, it would ultimately be Forsberg who would turn that into a somewhat lopsided deal. Sure, the Nordiques/Avalanche would parlay those pieces into Uwe Krupp (who scored the Cup-winning goal in 1996) and Patrick Roy, among others, but it would be the dynamic Forsberg that would emerge as the true centerpiece of that deal. Forsberg’s intense gaze was just the beginning. His ferocity on the ice was matched by few; his skill matched by even fewer. Over the course of the 1990s and early 2000s, Forsberg would become one of the game’s pre-eminent centers. His game was that of a power forward, but his skill was matched by next to none. He would routinely finish among the league-leaders in scoring despite missing chunks of game here and there as a result of his physical game. That game was so grueling thanks in part to a move he made famous: as the puck carrier, Forsberg would anticipate a checker and lower his shoulder, delivering a hit to the defender before he could be hit himself. Forsberg was a bull that could not be tamed, pushing defenders around at will at times. That style of play caught up to him by 2001-02: he had suffered a ruptured spleen during the 2001 playoffs, ending his season just 11 games into the extra season. By then, he was so beat up from his rough style that just about everything save his knees were in dire need of some rest. He would sit out that season to recuperate, unheard of for an athlete in his prime at that time. Despite that, he would return for the 2002 playoffs with an absolute vengeance, leading all scorers with 27 points in 20 games despite little to no practice time after missing an entire season. If it wasn’t clear just how dominant “Foppa” was before then, his playoff performance made it clear. Forsbeg would go on to win the Hart Trophy as league MVP while winning his only scoring title during the 2002-03 season. Unfortunately, a chronic foot injury began to take its toll on his game and after 39 games in 2003-04, Forsberg was gone to Philadelphia. Those foot problems limited him over the next six years, keeping Forsberg from being the Forsberg of old all the time. Flashes would peak through, but he just didn’t have the base to keep him going. He returned to the Avalanche for one last go in 2010-11, calling it quits after two games. During his time with the Avalance in the ‘90s and ‘00s, Forsberg was always the quite warrior. He went about his business professionally, opting to let his ferocious play do the talking. His willingness to battle almost – almost – made you forget just how talented he could be, but his points-per-game average (eighth all-time) jumps out at you. Peter Forsberg’s career wasn’t as long as some members of the Hall of Fame, but his impact during his prime can be matched by very few. Love live Peter the Great.